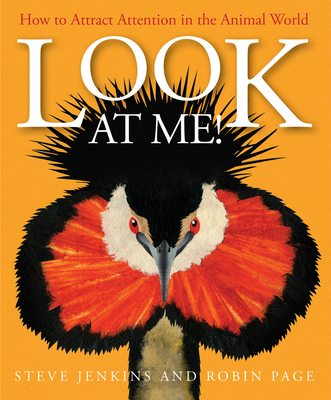 The latest offering from the award-winning team of Robin Page and Steve Jenkins focuses on the most unique and exciting animal displays in the natural world, used by creatures to stand out. This eye-catching, high-interest material is ideal for nature lovers, Jenkins fans, and even the most reluctant readers. Have you ever noticed that certain creatures have fur, feathers, and features designed to catch your eye? Chock-full of the fascinating facts and stunning art readers have come to expect from Jenkins and Page titles, Look at Me! is a pleasure to look at and an engrossing read. Showcasing the most attention-grabbing animals on the planet gathered together, Look at Me! helps readers understand the range of ways animals try to get one another's attention and why. From luring in prey to warning off predators, protecting themselves to attracting a mate, each animal has a remarkable display. These are animals you won't want to miss.